received their name and devíse. Since the time of St. Madeleine Sophie, each probation group has been given a name and a devíse that will accompany them as they live their vocation into the future. 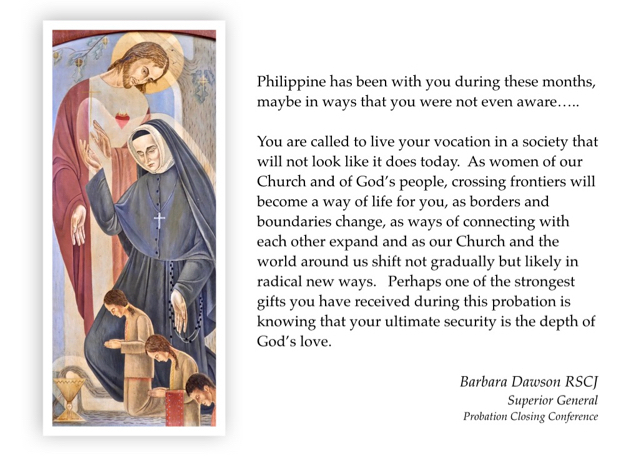 While these are a unique gift to each probation group, it is also an invitation to the whole Society of the Sacred Heart. With your final profession, you are joining Sophie who learned to love through friendships and suffering. She loved to say that she was born of fire and her only desire was to give the fire of Jesus’ love to the world. Sophie attuned her heart to Jesus’ heart, saying I have come to bring fire on earth, and how I wish it were already kindled (Luke 12, 49). And each one of us is called to do the same. And this is the devise that will mark the way that you as a probation community live your name. to the heartbeat of the world and the cries of God’s people. We ask that Jesus will continue to be the fire of your life and love. And that Mary, the one who taught Jesus how to love, the first woman of the early Christian community, will teach you to be tender and courageous. And Sophie, our oldest sister, who proclaimed her love for Jesus and the Church with depth, strength, courage and fidelity, will be with you as a sister and mentor along your life journey. May the Father’s love attune your heart to Jesus’ heart. and walk with them on their path. and may your joy become joy for others. and in the power of the Spirit who is with you forever.